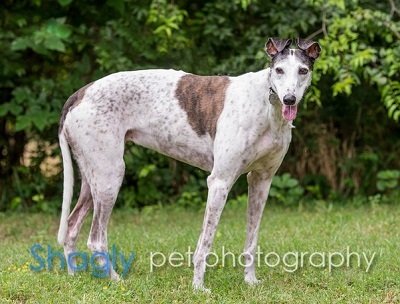 Maddie, aka Mayflower Madam, is a 10-year-old white and brindle female born March 1, 2005. Her sire is Craigie Whistler, making her grand sire the famous Molotov, and her dam is Prima Superior. She has 112 races on record beginning on September 25, 2006 in Raynham, Massachusetts and wrapping up in Wheeling, West Virginia on October 17, 2008. Check out those ears! She’ll be able to hear the treat jar from any room in the house! Maddie is an adorable girl who is ready for retirement filled with walks through the neighborhood and soft pillows for napping. Maddie is not considered cat tolerant at this time. 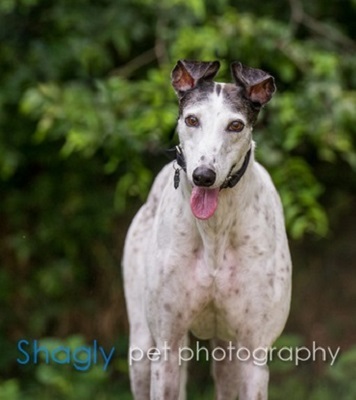 Sadly, after six years in a home, Maddie has returned to GALT due to no fault of her own. She will be using those impressive ears to search out a new family!